Today’s review covers the Anthropology, as quite frankly the 5.75″x46 size is where I tend to gravitate in terms of what I buy for my own enjoyment. . I don’t have a reliable retailer close to home, but whenever I visit family in Tennessee I pick up a few. I purchased those for today’s review from Silo Cigars in Knoxville. MSRP on this vitola is $7.25. Giving it the preliminary once-over, the Aquitaine wrapper is uniformly chocolate brown in color, with only the slightest of mottling. It has a marked oily sheen and feel to it, and moderate veining. Only one pronounced vein can be felt along its length. I don’t feel any density throughout, and construction appears to be spot-on. I didn’t bother to go through the whole cold-draw ritual with either of these cigars. Although I normally do this, cigars are made to be alight, no? The initial puffs of the Aquitaine are bold, with some “bright” cedar and moderate spice. As expected, today’s example eagerly took to fire, and the burnline immediately aligns with even continuity around its perimeter. The cedar character remains throughout this early portion of the smoke, but becomes more subdued as I get into the heart of the cigar. Going into the second inch, the spice is tempered by some sweetness. Rather than the typical cocoa sweetness, I find a more leathery core to the Aquitaine. Some earthiness peeks through on occasion, but overall it retains this leather and baking spice nature for me. This continues throughout the midsection, with some increase in strength. As a whole, I would put the Aquitaine into the heavier end of medium with regard to strength – but definitely full in body, with an almost velvety feel on the palate. Entering the final stretch, the strength does pick up a couple of notches, but never approaches an unmanageable level. It’s quite comfortable, actually. Throughout this final segment, the flavors remain bold and firmly within the leathery, baking-spice tempered range – and the spice returns in full force. In short, I dig it. 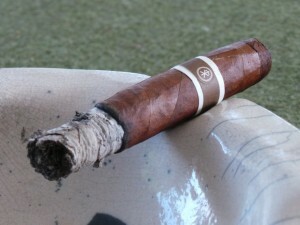 Only a year and a half into its life cycle, the RoMaCraft Aquitaine has earned a lofty spot in my humidor. No matter how many I bring home, they just tend to go up in smoke. They are “special occasion” cigars, at an everyday price. The value of this stick is remarkable. 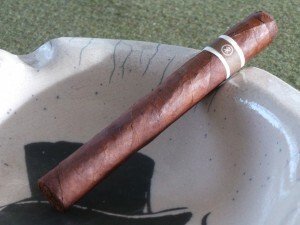 To me, that’s one of the things that has driven RoMaCraft’s quick ascent to a nationally recognized marque. They produce excellent cigars at a phenomenal price, right in the market “sweet spot.” With neither a century of tradition, nor an established name to coast upon, the dedication that Skip Martin and Michael Rosales (owners) have put into building their craft is apparent. Not only would I recommend the Aquitaine line, but any of their other offerings. You simply can’t go wrong with any selection from their range. I don’t assign numeric rankings to cigars; but if I were to do so, this one would be near the top. If you’d like to find out more about the RoMaCraft business model and cigars, you can check out last year’s Half Ashed Episode 028, where we had Skip Martin as guest. He offered a great deal of insight into how he and Rosales have built the company, and their products, from the ground up. Great review again. Will seek one out locally, I hope. Always interested in great value cigars. Thanks. Great Review Kip. I feel the same way. Great Cigar.